FROM MACON TO JACKSONVILLE is the follow up to CAPRICORN RISING by author Michael Buffalo Smith. While CAPRICORN RISING collected over twenty years of interviews with the many stars that came out of Macon, Georgia's Capricorn Records during the 1970s, FROM MACON TO JACKSONVILLE features in-depth interviews with many more of the stars that came out of Florida, Georgia, and the Carolinas during the hey-day of Southern Rock. From members of Lynyrd Skynyrd (Gary Rossington, Ed King, Artimus Pyle) and Molly Hatchet (Danny Joe Brown, Dave Hlubek, Duane Roland) to Outlaws (Henry Paul), Blackfoot, 38 Special (Don Barnes, Donnie Van Zant), Gov’t Mule, Doc Holliday, Col. Bruce Hampton, Widespread Panic, and many others, the Southern Rock world continues to be chronicled and celebrated. Also included are recently discovered archival conversations with legendary Allman Brothers Band roadie, Red Dog Campbell and the original Marshall Tucker Band's road crew chief, Moon Mullins. The foreword is by Charlie Starr of Blackberry Smoke. Since I started reading Buffalo’s latest book, I can’t seem to get anything done. I can’t put it down. 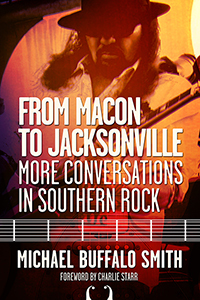 From Macon to Jacksonville is full of life stories straight from the mouths of your favorite Southern Rockers. Once again, as in his critically acclaimed CAPRICORN RISING, Michael Buffalo Smith captures the true essence of Southern Rock in this new book, FROM MACON TO JACKSONVILLE. A great read! Michael Buffalo Smith has been a long-time friend, and I can say unequivocally that he has more knowledge of the history of Southern Rock than anyone I know. Michael Buffalo Smith writes of what he knows and what he loves; those who share in that love him. Michael Buffalo Smith was a highly respected friend of my brother, Tommy Crain. He is a good man and a straight shooter. Michael Buffalo Smith is one of the biggest Southern music followers and supporters. As a writer, musician, and publisher, he has dedicated his life to promoting this music. Michael was my favorite interviewer--one reason is because he has great knowledge of the subject. His two latest books are FROM MACON TO JACKSONVILLE and CAPRICORN RISING, and I highly recommend both if you have an interest in music from the South.